Michael E. Price is Senior Lecturer in Psychology at Brunel University London. Religiosity appears to benefit wellbeing, potentially due to social support offered by religious communities. However, rising secularism implies that fewer people have access to these benefits. To address this problem, we investigated whether these benefits could also be obtained from membership in a secular, quasi-religious community. We conducted a longitudinal study among 92 members of the Sunday Assembly (SA), an international organization of secular congregations. SA members assemble in large services and in smaller interest groups that offer more face-to-face interaction. Once a month for six months, participants completed a questionnaire measuring wellbeing and participation in both SA and non-SA social activities. Panel analysis of longitudinal data revealed that participation in SA small-group activities positively influenced wellbeing over the six-month period, particularly among males. Participation in non-SA social activities, in contrast, had no effect on wellbeing. Aspects of the Sunday service that members perceived as most important, both for creating a sense of community and for friendship formation, were the informal socialising and cooperating that occurs before and after the service itself. Secular congregations may be a viable alternative for non-religious people (and perhaps especially men) who seek the health benefits that religious communities have traditionally offered. Religiosity appears to be positively related to wellbeing and health. Reviews of the large existing literature indicate that individual religiosity correlates positively with mental health (Graham & Crown, 2014; Hackney & Sanders, 2003; Smith et al., 2003) and negatively with all-cause mortality (Li et al., 2016; McCullough et al., 2000; Powell et al., 2003). The positive religion-health correlation has been observed among both genders, and although women generally tend to be more religious than men (review in Hvidtjørn et al., 2014), there is no clear theoretical reason to predict this correlation to be stronger in one gender than the other. Nevertheless, such gender effects have sometimes been observed: a few studies have found the religion-health relationship to be stronger among women (Koenig et al., 1999; Oman et al., 2002; Strawbridge et al., 1997, 2001), and at least one study has reported it as stronger among men (Maselko & Kubzansky, 2006). Researchers have not conclusively identified which aspects of religiosity are responsible for its associations with wellbeing and health, but one leading candidate is the stable community that religion provides. Numerous studies now suggest that social support acts as a positive predictor of health and wellbeing, in many social contexts (reviews in Hawkley & Cacioppo, 2010 and Holt-Lunstad et al., 2015). For what theoretical reason would social support promote wellbeing? The ultimate explanation would be an evolutionary one. Human beings evolved in highly social environments and are adapted for group living; ancestral humans depended on social relationships for resources such as shared food, care during periods of illness, and support in cooperative endeavors (Alexander, 1987; Price & Johnson, 2011; Tooby & Cosmides, 1996). People therefore tend to experience loneliness and social rejection as subjectively painful and stressful (Eisenberger & Lieberman, 2004). Cacioppo and colleagues (2014) characterize loneliness as the social equivalent of hunger and thirst: all three of these aversive states would have motivated human ancestors to seek resources they needed for survival and reproduction. Because loneliness is stressful, and because stress is associated with a wide range of psychological and physical ailments, loneliness tends to reduce wellbeing. The stress of loneliness is associated with, for example, increased depression, reduced emotional regulation (raising the risk of harmful conditions such as obesity and drug abuse), lower sleep quality, higher risk of cardiovascular disease, and poorer immune system functioning (Hawkley & Cacioppo, 2010). Given the apparent importance of social support to wellbeing, and the fact that religiosity tends to provide access to social support, it is plausible that social support is the main reason for the association between religiosity and wellbeing. Indeed, one prominent review of studies of religion and health (Powell et al., 2003) concluded that the only aspect of religiosity that seems negatively associated with mortality was social interaction in religious contexts (measured in terms of frequency of attendance at religious services). Other, more private and subjective facets of religiosity, such as depth of religious belief, did not appear to be significant independent predictors of mortality. Similarly, Lim and Putnam (2010) found that the higher life satisfaction of religious Americans was due to the social benefits of religious attendance, and not to any private aspects of religious belief. However, the issue of why religiosity relates to wellbeing has not been conclusively resolved, and other aspects of religion besides social support—such as increased optimism associated with belief in a caring God, or advocacy of abstinence from harmful practices like smoking—could in theory also enhance wellbeing (Abu-Raiya & Pargament, 2015; McCullough et al., 2000). Many researchers emphasize the subjective and private benefits of religiosity, with an especially common view being that private religious faith increases wellbeing by serving as a coping mechanism in times of adversity and stress (reviews in Abu-Raiya & Pargament, 2015 and Bryant-Davis & Wong, 2013). A major difficulty in assessing the extent to which wellbeing is affected by religious social support, independently of the effects of private religious belief, is that these two predictors of wellbeing are usually confounded. Historically there have been few social organisations providing religious-style community without concurrently advocating religious beliefs, so it has been difficult to isolate the independent effects of such community on wellbeing. The current study, however, focuses on a newly-developed secular organisation—the Sunday Assembly—that imitates many practices of traditional church communities. Studying this group provided a unique opportunity to identify whether this form of community support is an independently positive predictor of wellbeing, in the absence of religious beliefs. This issue is especially relevant because membership in traditional religion has been declining steadily in the UK and other Western nations over the past several decades (British Humanist Association, 2016; WIN-Gallup International, 2012). This decline suggests that people in these countries are increasingly missing out on the benefits of religious community. If similar benefits could be obtained through secular community, however, then people who are not traditionally religious may be more likely to obtain them. The Sunday Assembly. The Sunday Assembly (SA) is an international organization of secular congregations that was formed in London in early 2013 and has since spread rapidly around the world. It currently has chapters in more than 70 cities, mostly in Europe, North America, and Oceania. The SA movement is based on the ethos that people should come together to celebrate life even if they do not hold conventional religious views (e.g., belief in the supernatural). They call themselves a ‘secular congregation that celebrates life’ and espouse a simple philosophy of ‘live better, help often, wonder more’ (Sunday Assembly, 2016). SA congregations have Protestant church-like services on Sundays (usually twice monthly). Congregations range in size depending on location; smaller ones may involve fewer than 50 attendees, and larger ones may involve 200 or more. The structure of services is based on a formula devised at the flagship London congregation. A typical service lasts about an hour, and a typical running order (obtained from the London Sunday Assembly) is as follows: eight minutes of group singing (i.e., the congregation sings popular songs together, often accompanied by a live band and choir); introductory comments by the person leading the service that day (five minutes); a poetry reading (five minutes); a ‘TED’-style talk by a guest speaker (15 minutes); more group singing (four minutes); an inspirational personal talk by a congregation member (five minutes); community notices (three minutes); a moment of reflection (three minutes); passing of the collection plate and invitation to meet the people seated beside you (seven minutes); closing comments (one minute); and a final group song (four minutes). More extensive opportunities for interaction and cooperation occur before and after the service. As congregants arrive, they can socialize and cooperatively set the service up (e.g. arrange the chairs that will provide seating for the congregation). After the service, congregants can linger over shared refreshments and work together to close the service down. Besides the main Sunday service, the SA also offers opportunities for small group interactions, typically involving from five to fifteen people, throughout the week. These include ‘interest groups’ focused on some shared passion (e.g. craft-making, beer-tasting), local-area social clubs, and community action groups that volunteer to serve the larger community. These smaller groups offer opportunities for social interaction among like-minded congregants, interactions which are more face-to-face and frequent than those offered by the Sunday service. Study objectives. The goals of the current study were to assess the extent to which social participation with the SA, in comparison with other types of social organizations, was correlated with subsequent increases in wellbeing. By ‘social participation’, we mean the amount of time spent attending events and activities hosted by the relevant social organization, and by ‘wellbeing’ we mean general feelings of life satisfaction, happiness, and social connectedness, as assessed by the widely-used survey measures described below. We also aimed to assess which specific kinds of SA activities were perceived as most effective by SA members for promoting friendship formation and a sense of community. Finally, because some research has suggested that religiosity benefits one gender more than the other (as noted above), we also checked for gender differences in the relationship between SA participation and wellbeing. We addressed these issues via a longitudinal study, in which members completed one online survey per month over a six month period. Participants (N = 92) were recruited via an invitation from the SA to people who had provided their email address when they had attended an SA event. The survey was approved by the School of Social Sciences Research Ethics Committee at Brunel University London, and all participants gave informed consent before providing any data. At the time of their first survey, demographic and other characteristics of the participants were as follows. They were 58% female, ranged in age from 23 to 73 years (M = 45.20, SD = 12.98), and were 91% White, 5% Hispanic/Latino, and 4% other. 66% were married, cohabiting, or in a long-term relationship, 26% were not in a long-term relationship, and 8% described their relationship status as ‘other’. Most lived in the USA (53%) followed by the UK (41%), Australia (6%) and Canada (1%). To the question of how long they had been attending SA events, the most common responses were ‘12–18 months’ (39%) and ‘6–12 months’ (24%), and the mean response fell between these two categories (i.e. between 6 and 18 months). There were six online surveys in total. Each month, participants were emailed a link to the 5–10 minute survey and were asked to complete it within seven days. Participants were told that if they completed all six surveys they would receive an end-of-study report on their “activities and state of mind over the study period”, but were not informed about study intentions; 51 participants (55%) completed all six surveys and received the report. The mean number of surveys completed was 4.84 (SD = 1.64). Data collection occurred in three staggered cohorts, as participants joined the study, and lasted from April–September 2015 (cohort one), May–October 2015 (cohort two), and June–November 2015 (cohort three). Variables described below were collected on all six surveys, and descriptive statistics are based on mean values across all surveys. Wellbeing and loneliness. Three standard validated measures of wellbeing and loneliness were presented at the start of the survey in randomized order. One was the 7-item version of the Warwick-Edinburgh Mental Wellbeing Scale (NHS Health Scotland, 2008; Tennant et al., 2007); representative items include “I’ve been feeling optimistic about the future” and “I’ve been dealing with problems well”. Participants are asked how often they had had these experiences over the past two weeks, on a 5-point scale from “none of the time” to “all of time” (M = 3.71, SD = 0.44). This variable will be called ‘WE Wellbeing’ and had high reliability (α = .82). A second measure consisted of the four items that the Office of National Statistics (ONS) has used since 2011 to measure wellbeing in the UK (Schuller et al., 2012). Representative items include “Overall, how satisfied are you with your life today?” and “Overall, how anxious did you feel yesterday?” (reverse-coded), with responses on a 10-point scale from “not at all” to “completely” (M = 7.28, SD = 1.15). This composite variable will be called ‘ONS Wellbeing’ and had acceptable reliability (α = .77). A third measure was the De Jong Gierveld Loneliness Scale short version (Gierveld & Van Tilburg, 2006). A seventh item, “I often feel lonely”, was added to this scale since no other items asked about loneliness directly. Representative items include “I often feel rejected” and “There are many people I can trust completely” (reverse-coded), with responses on a 5-point scale from “disagree strongly” to “agree strongly” (M = 2.24, SD = 0.79). This composite variable will be called ‘Loneliness’ and had high reliability (α = .87; with seventh item excluded, α = .84). Finally, to create a single general wellbeing measure and avoid problems of multiple testing, we summed the z-scores of WE wellbeing, ONS wellbeing, and Loneliness (reverse-coded) (M = 0.07, SD = 0.78). This composite variable will be called ‘Composite Wellbeing’ and had high reliability (α = .82). Extent to which SA Sunday service activities facilitated social bonding. We asked about two types of social bonding. First, we focused on their general sense of community by asking, “Over the past month, what aspect of the main Sunday gathering made you feel most closely connected to other attendees, and most a part of the Sunday Assembly community?” Second, we focused on friendship formation by asking “Over the past month, what aspect of the main Sunday gathering made it easiest for you to meet and make friends with other people?” Participants wrote responses in a text box. Attendance at the SA Sunday service. Participants were asked “Over the past month, how many times did you attend the Sunday Assembly’s main Sunday gathering?” and could respond from 0 to ‘3 or more’ (most SA chapters hold two services per month) (M = 0.99, SD = 0.49). This variable will be referred to as ‘SA Sunday attendance’. Participation in other SA activities. Participants were instructed to “Please indicate how much time you spent attending other Sunday Assembly activities over the past month”, on a scale from 1 to 8 and were then recoded as the mid-point (in hours) of each of these categorical variables. Eight kinds of activities were listed as items: (1) Community action, (2) Interest groups (e.g., Book club, Wonder club, Crafts club), (3) Resolve group, (4) Local area social groups, (5) Choir, (6) Tea team, (7) Helping out at the Sunday Assembly, and (8) Other(s). This variable will be referred to as ‘Other SA activities’ and was computed by summing the total hours spent in all eight activities (M = 5.39, SD = 6.47). Participation in non-SA activities. Participants were asked, “Over the past month, how much time have you spent attending social activities associated with other organisations (besides the Sunday Assembly)?” Responses were on a scale from 1 to 8 and were then recoded as the mid-point (in hours) of each of these categorical variables. Five kinds of activities were listed: (1) Religious or spiritual organisation, (2) Secular organisation (e.g. Humanists), (3) Sports club, (4) Service/volunteer club, and (5) Other(s). This variable will be referred to as ‘Non-SA activities’ and was computed by summing the total hours spent in all five activities (M = 5.20, SD = 5.37). Table 1 presents intercorrelations and descriptive statistics (averaged across all six surveys) for main study variables. Note. *p < .05, **p < .01. Descriptive statistics are averaged across all six surveys. SA = Sunday Assembly, WE = Warwick-Edinburgh, ONS = Office of National Statistics. Number of close relationships. Participants said they had a mean of 7.51 total close relationships, with 1.21 of them involving people they had met through the SA. Gender differences in mean numbers of reported total relationships and SA relationships were in the direction of being higher for women, but were not significant (total relationships: female M = 7.80, male M = 7.28, t = –4.71, p = .64; SA relationships: female M = 1.33, male M = 1.12, t = –4.71, p = .62). 57.6% of participants reported on at least one survey that they had at least one close relationship with someone they had met through the SA, whereas 42.4% never reported having any such relationship. Extent to which SA Sunday service activities facilitated social bonding. Responses to the question about sense of community appear in Table 2a, and responses to the question about friendship formation appear in Table 2b. In both cases, the kinds of activities mentioned most frequently are interactive social activities: “Socializing before/after service” and “Helping organise/run service” were mentioned by a mean of 54% of participants per survey in response to the “sense of community” question, and by a mean of 63% of participants per survey in response to the “friendship formation” question. “Singing” was another relatively frequent (15%) response to the “sense of community” question. Effects of Activities on Sense of Community and Friendship Formation. Note. For Table 2a–b, figures in the % column indicate mean percentage of participants (of those who mentioned at least one activity) per survey who mentioned the activity in response to the question of which SA Sunday service activities most contribute to sense of community (Table 2a) or friendship formation (Table 2b). Participants could name more than one activity per question. Only the seven most frequently mentioned activities are listed in each table. Comparative wellbeing of our sample. One of our wellbeing measures is also used by the UK Office of National Statistics (ONS), so we can compare our UK participants’ wellbeing to the UK average. Only an informal comparison is possible, however, as ONS provides only mean scores for population categories, with no information about variance. The mean ONS wellbeing score among our UK participants was 7.24 (SD = 1.33, n = 37, 64% female, mean age = 44.20 years; this score is close to that of our full sample: M = 7.28, SD = 1.15). Our UK participants’ ONS wellbeing score appears to be lower than the national scores for UK men (7.67), UK women (7.70), and UK residents aged 40–44 (7.54) (Office for National Statistics, 2016), suggesting that people with below-average wellbeing may be especially likely to join the SA. Relationship between activities attended and wellbeing. Panel analysis was undertaken with the R package plm version 1.5–12 (https://CRAN.R-project.org/package=plm), using self-reported SA Sunday attendance, participation in other SA activities and participation in non-SA activities to predict each of the four measures of wellbeing separately. This analysis, also known as cross-sectional time-series analysis, accounts for effects caused by individual variability and timepoint, and uses the data at all timepoints to test for a directional relationship (i.e., whether a variable at timepoint 1 predicts a variable at timepoint 2, etc.). This is more appropriate than other regression techniques (e.g. OLS) when modelling time series with multiple cases, as with the current data (Beck & Katz, 1995). Although the current study design does not allow for causal inference, it does permit testing for relationships between variables in both directions, in order to infer which directional relationship better fits the data. In panel analysis, fixed effect models allow for individual characteristics that influence the outcome variable, while random effects models allow additional variation across individuals that is not correlated with other variables in the model. While random effects models are likely to be most appropriate in this case, Hausman tests were used to determine that a fixed effect model was sufficient for the Loneliness measure. To avoid overfitting, therefore, fixed effects models were used for Loneliness. Models for WE Wellbeing, ONS Wellbeing, and Composite Wellbeing were significantly good fits for the data overall (all p-values < .01; adjusted R2 = .21, .14, and .03 respectively), but only the Other SA activities variable acted as a significant predictor in each of these models (all p-values < .05), meaning SA Sunday attendance and Non-SA activities did not predict these wellbeing measures (Table 3). Panel models including these variables did not significantly predict Loneliness (p = .3). Breusch-Godfrey tests suggested that no models contained residual auto-correlation (all p-values > .05). Figure 1 uses standardized coefficients to describe the comparative effects of Other SA activities and Non-SA activities on the three wellbeing measures. 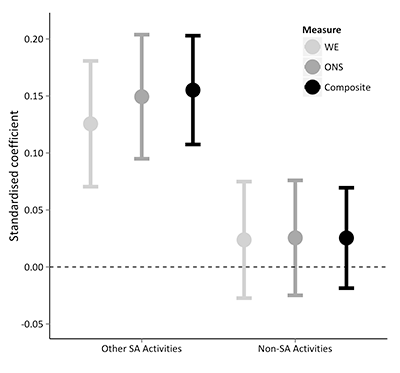 As this figure shows, Other SA activities had significant effects of similar magnitude on each wellbeing measure, whereas Non-SA activities had non-significant effects of similar magnitude on each wellbeing measure. Coefficients, standard error (SE) and p-values of each of the activities predicting wellbeing measures in panel analysis. Note. WE = Warwick-Edinburgh, ONS = Office of National Statistics, SA = Sunday Assembly. Standardized coefficients describing effects of Other SA Activities and Non-SA Activities on three wellbeing measures: Warwick-Edinburgh (WE), Office of National Statistics (ONS), and composite (composed of WE, ONS, and Loneliness). Effects are significant for Other SA Activities (all three p values ≤ .02) and non-significant for Non-SA Activities (all three p values ≥ .6). Error bars represent one standard error. While this analysis assumes directionality, it does not explicitly test whether a relationship between wellbeing and SA attendance could also exist in the opposite direction (i.e., whether wellbeing and SA attendance might correlate with one another between subsequent time points in a non-directional manner). To determine whether the relationship is bidirectional (and therefore less likely to be causal), we tested whether wellbeing measures at lag 1 (i.e., the previous data collection point) are also predicted by SA Sunday attendance, Other SA activities, and Non-SA activities. None of these acted as significant predictors of earlier wellbeing (all p-values > .05), suggesting a uni-directional relationship from earlier attendance at Other SA activities to later increases in wellbeing. We also tested panel models in both males and females separately, and found that none of the activity types were significant predictors of wellbeing in females. In males the same pattern of results was identified as above, with Other SA activities acting as a significant predictor of WE (0.01, SE = 0.006, p = 0.02), ONS (0.05, SE = 0.02, p < 0.01) and Composite Wellbeing (0.03, SE = 0.008, p < 0.01). Given that there were fewer men (N = 39) in the sample than women (N = 53), and that each group had similar amounts of missing data over the six timepoints (Males = 49, Females = 52) this gender difference cannot be explained by sample size. Results indicated that SA participation tended to relate positively to participant wellbeing. Participants reported that 16% (1.2 out of 7.5) of their close social relationships were with people they had met through the SA, and 57.6% of participants reported, on at least one of the six surveys, that they had established at least one such relationship. These results indicate that SA members were establishing close relationships with one another to some extent; whether this extent is considered ‘small’ or ‘large’ depends somewhat on one’s perspective. On the one hand, 16% constitutes a fairly small minority of one’s relationships. On the other hand, the average of 7.5 total close relationships that participants reported probably included, for many participants, some family members. If we had asked about friends only, therefore, the 16% figure would likely have been larger. The rates of relationship formation we obtained seem similar to those observed in more traditional religious communities: religious service attendees in the USA reported having a mean of 0.95 close friends in their congregations (Lim & Putnam, 2010), and 46% of Australian churchgoers reported having some close friends in their congregation (Kaldor et al., 1994). The aspect of the main Sunday service that was perceived as being most conducive to both sense of community and making friends was not any formal aspect of the service itself, but rather the informal social and cooperative interaction that occurred before and after the service (as noted above, 54% of participants said this interaction was conducive to community, and 63% said it facilitated friendship formation). These results suggest that direct interpersonal engagement is a particularly important component of social bonding. This importance would make theoretical sense, as such engagement is probably an especially effective way to acquire information about someone’s potential value as a social associate. Direct engagement allows one to assess whether a potential partner seems, for example, compatible in terms of shared values and interests, and reliable and trustworthy in cooperative interactions. As noted in evolutionary theories such as those cited earlier (Price & Johnson, 2011; Tooby & Cosmides, 1996), this is the kind of information that people should be adapted to seek, in order to assess another person’s suitability as a friend, mate, or cooperative partner. The importance of direct interpersonal engagement is also suggested by results of the panel analysis. This analysis indicated that over the six-month study period, participation in small-group SA social activities (‘Other SA activities’) was a significant predictor of the Warwick-Edinburgh and ONS wellbeing measures and of composite wellbeing. This effect size was not massive, but was considerable: for example, 10 hours per month of participation in small-group SA activities was associated with an increase of 0.3 in ONS wellbeing score; in our sample this could raise one’s ONS score from the 59th to the 69th percentile (i.e. from 7.5 to 7.8). SA small-group activities had this effect on wellbeing despite being unrelated to loneliness scores. The ecological nature of the current study (that is, the fact that it involved people already attending the Sunday Assembly, rather than random assignment to a ‘Sunday Assembly condition) does not permit inference about the causal direction of the relationship between SA participation and wellbeing. However, the study’s longitudinal nature does permit us to conclude that this relationship is occurring in the temporal direction that would at least be consistent with SA participation causing wellbeing to increase. That is, whereas earlier SA activity attendance predicted a later increase in wellbeing, later SA activity attendance did not predict an earlier increase in wellbeing. It is not immediately clear why small-group participation would increase wellbeing in general but not decrease loneliness in particular. It may be the case, however, that the psychological benefits of such participation are more global than can be captured by a relatively specific loneliness measure, and were therefore more effectively captured by measures of general wellbeing. It is also not entirely clear why participation in SA small-group activities was associated with enhanced wellbeing, whereas the ‘Non-SA activities’ (sports and service clubs, other religious-type groups, etc.) variable was not. It seems plausible, however, that the SA would be particularly effective at building community since its social identity focuses so much on doing just that. SA attendees are likely to be aware of the SA’s strong emphasis on building community, so any success the SA actually had in that regard would be consistent with the notion that “social support is… likely to be given, received, and interpreted in the spirit in which it is intended” (Haslam et al., 2009: 11). An unexpected yet intriguing finding was that positive relationships between SA small-group activities and wellbeing occurred only among males. Our study is not the first to find a gender effect in the strength of the relationship between wellbeing and religious-type activity; as noted in the introduction, the religion-health correlation has been reported (with no clear theoretical rationale) to be stronger among women in some studies (Koenig et al., 1999; Oman et al., 2002; Strawbridge et al., 1997, 2001) and among men in at least one study (Maselko & Kubzansky, 2006). What might account for the stronger effect among men in our study? One possible explanation is that men in our sample had fewer close relationships outside of the SA, and so were in a position to benefit disproportionately from the social opportunities offered by the SA. Supporting this explanation is research suggesting that among US and UK residents in their late thirties or older, women tend to have more friends than men (Bhattacharya et al., 2016; Fischer & Oliker, 1983). In the current study, however, although women did report having slightly more close relationships than did men, this gender difference did not achieve significance. Moreover, these women also reported having slightly more close relationships with people they met in the SA (although the gender difference was again not significant), which is not consistent with the notion that the social benefits of SA participation were accruing disproportionately to men. An alternative explanation for why the relationship between SA participation and wellbeing was stronger in men would be that men tend to be especially comfortable bonding socially in communities that are characterised by an absence of references to a God-like power. There does appear to be a clear pattern cross-culturally, including in the USA and Europe, of men being more likely than women to describe themselves as lacking religious beliefs (Hvidtjørn et al., 2014; Keysar & Navarro-Rivera, 2013; Trzebiatowska & Bruce, 2012). From an evolutionary perspective, shared interests function as an essential aspect of coalitional affiliation and group bonding (Tooby, Cosmides & Price, 2006), so lack of religious belief may function especially effectively in this regard among male SA participants. Finally, although informal social interaction seemed to be the most important aspect of friendship and community relationship among SA participants, one formal aspect that did score fairly highly was singing: 15% of participants mentioned group singing (involving the whole congregation) as the aspect of the service that most facilitated a sense of community. This result complements other studies which have found collective singing to be conducive to social bonding (Pearce, Launay, & Dunbar, 2015; Weinstein et al., 2016). This effect is predicted by the theory that over human evolutionary history, group singing has facilitated the formation of adaptive cooperative relationships, by efficiently enabling multiple individuals to engage in coordinated and synchronized social interaction (Dunbar et al., 2012; Weinstein et al., 2016). This study had some significant limitations. It was intended as a field study rather than a clinical trial, as key aspects of a well-controlled clinical trial—such as random assignment to experimental conditions, including a control condition—were not possible in the real-world context in which the study was conducted. We do not wish to suggest that if we had randomly assigned members of the general public to participate in either SA social activities, non-SA social activities, or no social activities, then we would have found a greater increase in wellbeing among SA participants than members of the other groups. Our sample was necessarily composed of people who had already expressed some interest in the SA, and so were probably relatively likely from the outset to benefit from SA activities (e.g., due to their openness to a secular worldview), compared to members of the general population. Further, as participants were unpaid volunteers, we had little control over how consistently and completely they participated over the six-month study period (although we should reiterate that this participation was nevertheless fairly extensive, with participants completing an average of 4.8 out of 6 surveys). Despite these limitations, our results do suggest that participants in SA social activities experienced a significant increase in wellbeing in relation to this participation, which they did not experience in relation to their social participation in groups that were not SA-related. With religiosity on the decline in the UK, USA and many other countries, our results are an encouraging indication that secular quasi-religious organizations might be able to help provide the benefits that religious groups have traditionally provided. These results suggest that a particularly important way in which such organisations can benefit members is by providing opportunities for them to engage in direct social interaction before and after formal services, and especially in small groups that meet throughout the week and that provide more frequent opportunities for close social contact. Our results suggest two especially interesting avenues for further research. One would be to further examine the issue of why SA attendance related positively to wellbeing in men only. As noted earlier, when other studies have noted gender differences in the relationship between wellbeing and religious attendance, this relationship has usually (but not always) been more positive among women. In assessing why the relationship we observed was stronger among men, the first task would be to see if this result replicates in other studies of wellbeing in secular communities. If so, then it would certainly be worth investigating the reasons for this difference. Future studies could indicate whether it is due, as we have suggested, to men being more likely to experience a lack of religious belief as an aspect of coalitional affiliation that facilities social bonding. A second direction for future research would be to investigate whether the correlation between wellbeing and secular community membership increases in proportion to membership duration. Most participants in our study had not been SA attendees for long; 86% had been attending for less than 18 months. It seems likely that the kind of positive relationships we observed between attendance and wellbeing would tend to increase over time, simply because more time would afford more opportunities both to cultivate long-term relationships and to initiate new ones. Although secular quasi-religious organizations are still a relatively rare phenomenon, there are some signs that they are becoming more prominent. The Sunday Assembly’s global expansion has occurred rapidly since its 2013 founding, and other Humanist-influenced groups seem to be growing as well (Cimino & Smith, 2014). If secular congregations continue to gain popularity, they could have a positive benefit on the wellbeing of many people who, for whatever reason, would affiliate more readily with them than with more traditional religious groups. Thanks to Sanderson Jones, Jack Reynolds, Michael Plant, and Liz Slade. Alexander, RD. 1987. The Biology of Moral Systems. Hawthorne, NY: Aldine de Gruyter. British Humanist Association. 2016. Religion and belief: Some surveys and statistics. Retrieved from: https://humanism.org.uk/campaigns/religion-and-belief-some-surveys-and-statistics. Kaldor, P, Bellamy, J, Powell, R, Correy, M and Castle, K. 1994. Winds of Change. Anzea: Homebush West, NSW. Koenig, HG, Hays, JC, Larson, DB, George, LK, Cohen, HJ, McCullough, ME, et al. 1999. Does religious attendance prolong survival? A six-year follow-up study of 3,968 older adults. Journals of Gerontology Series A: Biological Sciences and Medical Sciences, 54(A): M370–M376. NHS Health Scotland. 2008. The short Warwick-Edinburgh mental well-being scale. Retrieved from: http://www2.warwick.ac.uk/fac/med/research/platform/wemwbs/swemwbs_7_item.pdf. Office for National Statistics. 2016. Happiness, Worthwhile, Life Satisfaction, and Anxiety by Personal Characteristics, April 2012 to March 2015 [data files]. Retrieved from: http://www.ons.gov.uk/peoplepopulationandcommunity/wellbeing/datasets. Schuller, T, Wadsworth, M, Bynner, J and Goldstein, H. 2012. The measurement of well-being: The contribution of longitudinal studies. Office for National Statistics. Retrieved from: http://www.ons.gov.uk/ons/guide-method/user-guidance/well-being/publications/the-contribution-of-longitudinal-studies.pdf. Strawbridge, WJ, Shema, SJ, Cohen, RD and Kaplan, GA. 2001. Religious attendance increases survival by improving and maintaining good health behaviors, mental health, and social relationships. Annals of Behavioral Medicine: A Publication of the Society of Behavioral Medicine, 23(1): 68–74. Sunday Assembly. 2016. Retrieved from: https://www.sundayassembly.com. Tooby, J and Cosmides, L. 1996. Friendship and the Banker’s Paradox: Other pathways to the evolution of adaptations for altruism. In: Runciman, WG, Maynard Smith, J and Dunbar, RIM (eds. ), Evolution of Social Behaviour Patterns in Primates and Man. Proceedings of the British Academy, 88: 119–143. WIN-Gallup International. 2012. Global index of religion and atheism. Dublin: RED C Research.